Although more substantial breakfasts are always an option, most people in Quebec eat a small breakfast consisting of bread or a muffin with jam, juice and coffee. A popular lunch is a meat sandwich on special bread (called by the Italian name "panini"), along with salad, dessert and coffee. Dinner tends to be not much larger than lunch, but more formal insofar as there is usually a cooked meat dish, a starch, salad, and dessert. Coffee is very popular, enjoyed in the morning, mid-morning, at lunch, late afternoon and possibly with dinner. Soft drinks are also popular. It is not uncommon for Canadians to enjoy a glass of beer or red wine for a bit of relaxation after dinner. The legal drinking age in Canada is 18, and it is enforced. When one speaks of cuisine in Canada and Quebec, it is important to remember that in Canada, somewhat like in the United States, there is a conglomerate of influences. What Canada is especially famous for is a fine array of smoked meats, particularly the famous “Canadian Bacon.” These various smoked meats can be found at most Canadian restaurants since they are so highly in demand. There is another famous specialty called “poutine,” which consists of french fries and melted cheese covered in a choice of either meat, barbecue or cheese sauce. Poutine is found in both fast food and fancier restaurants but only in the province of Quebec. 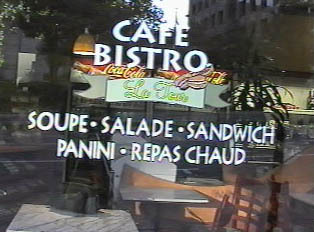 Canadian restaurants consist predominantly of national chains. It is not uncommon for these family restaurants to offer a variety of smoked and cooked meats, poutine, pizza and pasta dishes. Many restaurants operate buffet style, which is very popular in Canada. Canadian cities offer a wide variety of ethnic restaurants, such as Chinese, Japanese, Italian, Mexican, Lebanese, and Iranian. Many varieties of ethnic foods can also be found in the malls. American fast food chains are present in Canada as well. When invited to a home for dinner in Canada, a guest is not expected to bring something and it is not considered rude to show up empty-handed. However, it is always polite to ask if anything is needed, and certainly there is no harm in arriving with a dessert or a bottle of wine. "Did You Enjoy Your Meal?"